Marie Hélène Miribel, known as « Petit ». She was born in France where she studied economics and then developed a carrier as mining trader which brought her to Peru. After some time, the persuit of her dream about creating a transcendental business that would give them the opportunity to merge with the local community arrives in to the Sacred Valley of the Incas where she created Sol y Luna an exclusive hotel that allow her to support a project of education for local childhood. Petit run the hotel, hosting every single guest and managing all the services. Sol y Luna is a luxury hotel member of Relais & Chateaux. Sol y Luna is a property developed on the basis of a genuine experience of the place, with personalized, high end and attentive service. It is very important to transmit Sol & Luna values to the trade of the principal markets as Unites States, United kingdom, European countries, and some emergent countries as Brazil or Mexico. Our first clients told us they were left yearning for more when they discovered the Sacred Valley. The idea of accommodating our visitors in individual little houses, all surrounded by gardens with doors facing the mountains, was a key factor that distinguished us from other traditional hotels from the beginning in September 2000’s. Little houses built with adobe, wood and handcrafted tiles, in harmony with the surrounding landscapes. 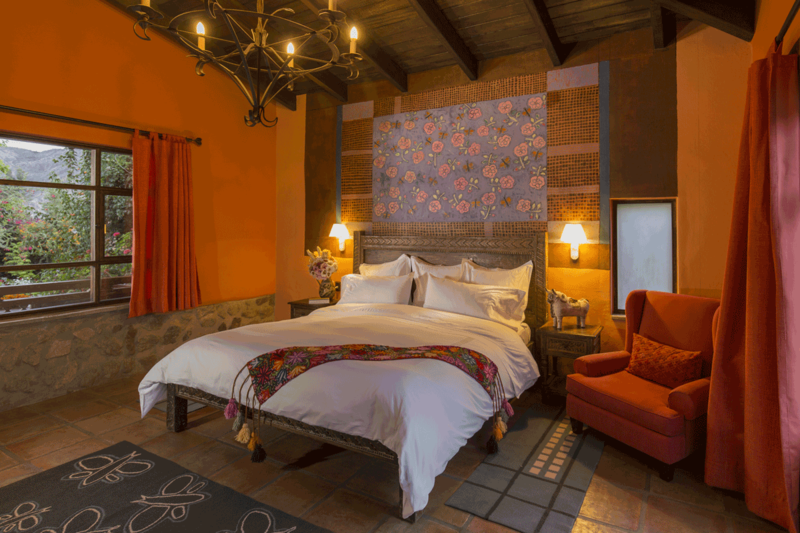 Their interiors were designed to spoil our guests with warm, cozy rooms. Our terraces invited the contemplation of our green garden full of flowers, and home to more than 35 species of local birds. 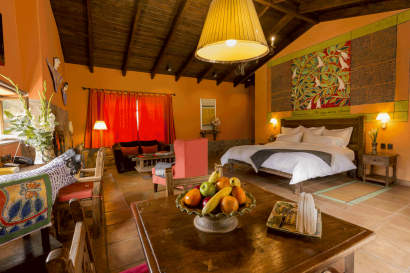 The evolution of Sol y Luna led us to express our concept of luxury through exclusivity, authenticity, beauty and art, and to the creation of our Luxury Suites –Casitas de Lujo – rated as the most surprising, pleasant and sophisticated in Peru. Each Casita features an original mural creatively representing the flora and fauna of the Sacred Valley. May 2016. Sol y Luna is almost ending an addition of a heated swimming pool plus an area of terraces equipped with a lounge area; dinning garden view; free Jacuzzi tub and gym. The harmony of the eclectic architecture with the surrounding nature , plus the presence of the local art, personal service of their owners, the high quality of the gastronomy, and the track we left . Our proposal goes beyond just the business of running a hotel business. 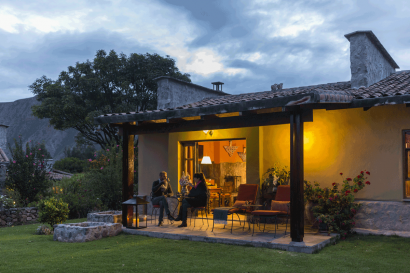 We are part of the Sacred Valley and we have developed Sol y Luna together with the community. 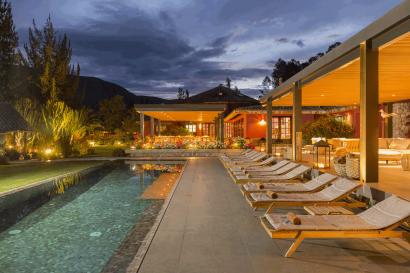 Surrounded by the mountains, at a short distance from Machu Picchu, Sol y Luna is nested on the heart of the Sacred Valley of the Incas, In Urubamba 60 kilometers away from Cusco City. Archaeological sites as Machu Picchu, Ollantaytambo, Pisac, Moray , among others. Outdoor activities on the Sacred Valley kayaking, mountain biking, paragliding, horseback riding. Bird watching tours, visits to the Andean communities to know about their ancestral culture. Our garden, full of flowers the whole year is home to more than 35 species of local birds. From April to end of October each year we present a contemporary circus season. The nights of, Wednesday, Thursday, Friday and Saturday at 7:30 pm . 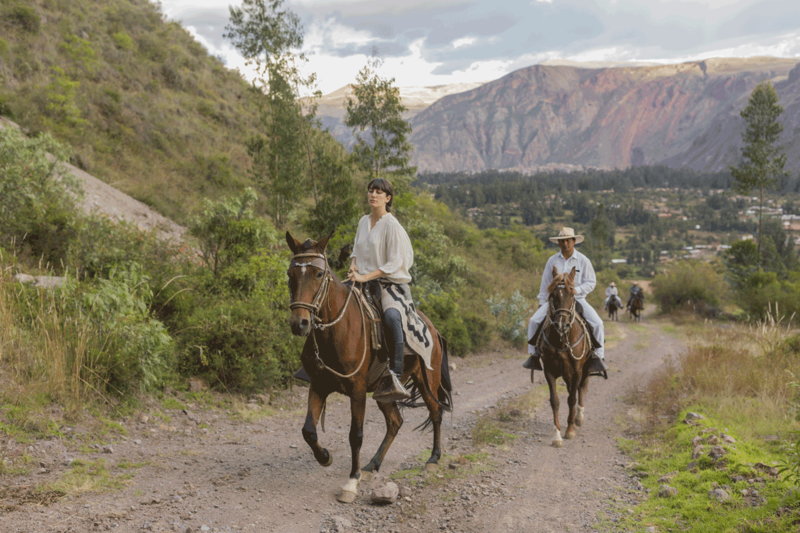 Our stables shown the culture of the Peruvian paso horses, well trained animals and the handmade gears. The extension of our garden allow us to arrange casual time for the children, we do have also some traditional Peruvian games as the “Sapo game”, it is also possible to spend some time with the horses at the stables of the hotel, or arrange a workshop of pottery lessons, a pizza night, or a visit to the farms. Most of our outdoor activities are available for children since 6+ years old, restrictions may apply. Services and Facilities: Porch, LCD TV, Lounge area, Heated floors, Private terraces, Walk -in closet, Mini bar, Room Service, Complimentary WIFI, Fireplace, Laundry Service, Safe box, Our collection of sheet sets are made with 100% high-count Peruvian Pyma cotton, Goose down duvets and pillows , BOSE surround sound system with IPOD, Marble bathroom, double vanity and amenities L’occitane, Bathrobe and slippers made on the finest cotton. Services and Facilities: Porch, 02 LCD TV, Lounge area, Heated floors, Private terrace with Jacuzzi, Walk -in closet, Mini bar, Room Service, Complimentary WIFI, 02 Fireplaces, Laundry Service, Safe box, Our collection of sheet sets are made with 100% high-count Peruvian Pyma cotton, Goose down duvets and pillows , BOSE surround sound system with IPOD, Marble bathroom, double vanity and amenities L’occitane, Bathrobe and slippers made on the finest cotton Separate living area. Services and Facilities: Marble-tiled bathroom, temperature heating, telephone, complimentary WIFI, safe box, private terrace, coffee table books, peruvian pyma cotton bed linen, bathrobes and sleepers, toiletries and duvets. 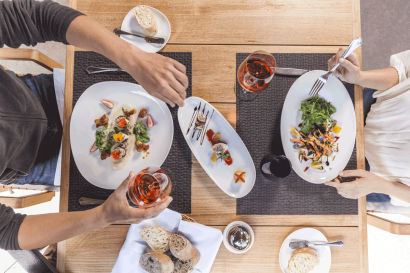 Meal service times: Breakfast: 05:00 a.m. to 10:00 a.m.; Lunch: 12:00 p.m. to 3:00 p.m.; Dinner: 6:00 p.m. to 10:00 p.m.
We have achieved a highly sophisticated cuisine that respects the primary flavor of the local ingredients, updated seasonally, we collect the tastes and spirit of the Sacred Valley’s and give them a contemporary interpretation. Meal service times: Lunch: 12:00 p.m. to 3:00 p.m.; Dinner: 6:00 p.m. to 10:00 p.m. Menu in Wayra is as casual as its atmosphere. 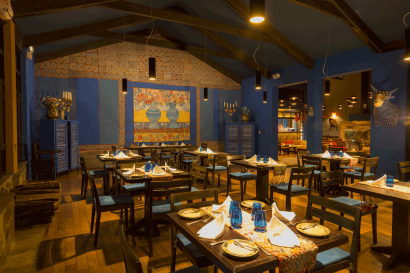 It has been elaborated with local, seasonal produce and is an immersion into regional cooking interpreted by our chef. Each dinner at Wayra is different thanks to the versatility of ingredients and seemingly endless variety of preparations. Vegetables are harvested in the valley’s plots as are the aromatic herbs. 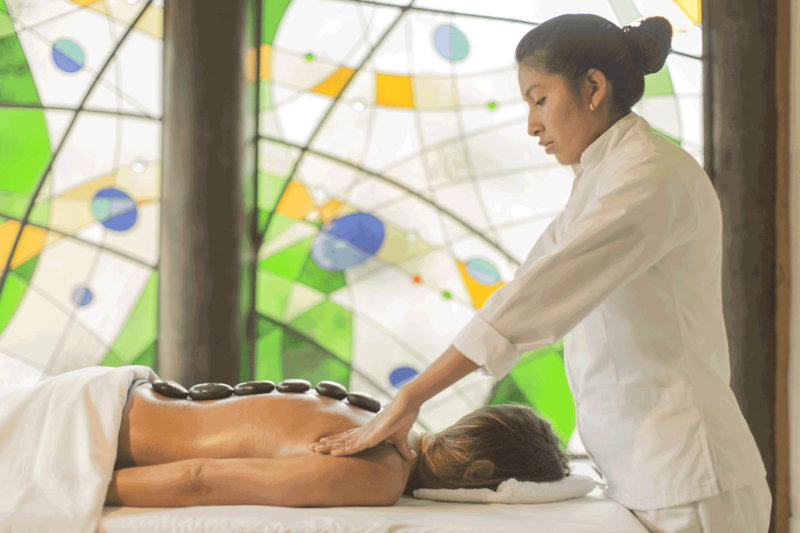 • Yacu Wasi Spa: A space made for indulgence, where pureness, peace and freshness combine. There, a perfect balance between body, mind and spirit is the result of the experiences offered by our professional staff. Auditorium meeting room, Capacity of 100 people, equipped. It is a comprehensive space, filled with light and offering views onto the gardens and mountains that surround Sol & Luna. Not only can it host business meetings and academic events but it also aspires to offer great dynamism to art exhibits and activities aimed at guests. Main facilities: business center, foyer and coffee break area, multimedia equipment. • Outdoor activities; tandem paragliding flights, kayaking on the lagoons, mountain bikes, ATV tours, Peruvian Paso horseback riding, hikes. • Cultural animations: Theatre presentations; Cabaret of contemporary circus; exhibition of Peruvian Paso horses; traditional textile demonstration, pottery workshop. 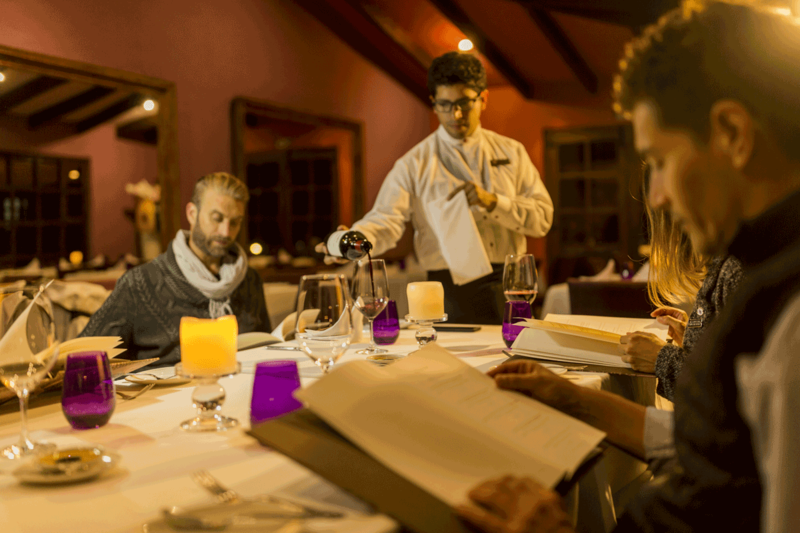 • Gastronomic experiences: Cooking classes, Demonstration of Peruvian cuisine, visits to the farms and local markets; pizza night, chef table service. Wine cellar, wine pairing menus, tasting. • 2015 Awarded between the best hotel in Peru by Trip Advisor travelers choice. 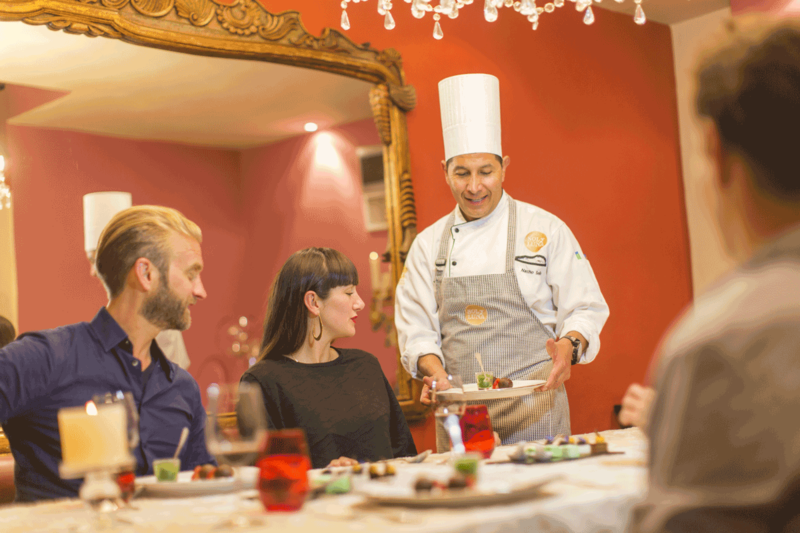 • 2014 Awarded between the best hotel in Peru by Trip Advisor travelers choice. • 2013 Awarded as the best hotel in Peru by Trip Advisor travelers choice.